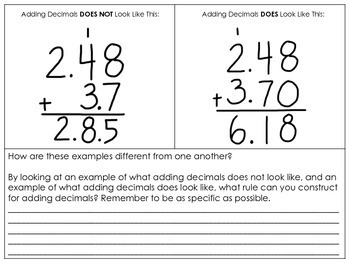 This activity was developed to engage students in the process of constructing a rule for adding decimals by examining correct and incorrect examples. Then the mad scientist is ready to send his assistant to the body shop to purchase a variety of body parts to construct new monsters like Frankenstein. 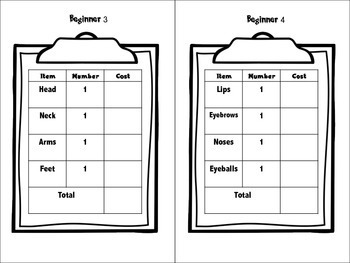 This activity also comes with 4 beginning, 4 intermediate, and 4 advanced level task cards plus two create your own task cards for a total of 14 task cards. 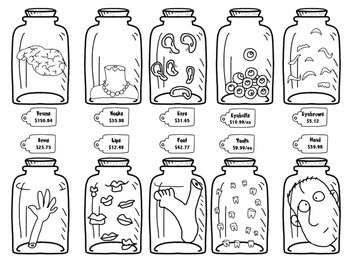 In addition a sales flyer showing the prices of each body part at the body shop is included. 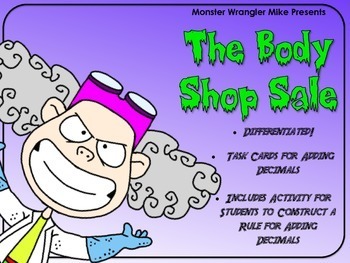 Advanced students may begin inquiring about multiplying decimals as a short cut for repeatedly adding the same prices which would be a natural progression from adding decimals to multiplying decimals. NOTE: This set is a part of a larger set available in my store so please DO NOT purchase this set if you have already purchased the set titled, "Devious Decimals" at http://www.teacherspayteachers.com/Product/Devious-Decimals-Writing-Comparing-Rounding-and-Operations-945597. Thanks for your purchase and enjoy!